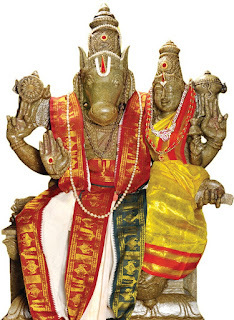 Sri Lakshmi Narayana Homam ensures you with material wealth in abundance. Goddess Lakshmi is the consort of Lord Vishnu (Narayana), who also bestows his devotees with wealth and prosperity. When you yearn to overcome debts, financial difficulties and relationship issues, call upon the Gods of riches and assets. Lord Sri Narayana (Vishnu) and his consort Goddess Sri Lakshmi are the chief deities of this powerful Homam. You will feel empowered in terms of richness and prosperity. Goddess Sri Lakshmi is the embodiment of wealth, whereas, Lord Narayana/Vishnu is the savior. While the Goddess of Wealth will grant you with boons of prosperity, material abundance, good luck, harmony and spiritual prosperity; Lord Narayana will protect your riches and save you from unforeseen financial obstacles! Performing this Homam, bestows you with the power and supremacy to fulfill and accomplish financial success all through your life. Sathru Samhara Homam at Danvantri Peedam on Sunday the 13th March 2016 - 10 AM, on the occasion of Sashti. ‘Shatru’ means ‘Enemy’ and ‘Samharam’ is a sanskrit word which means ‘Destruction’. The destruction of our enemies is the main goal of this homam. Ancestral money not being settled amongst brothers..
No footfalls in business and constant losses. You might be a business magnet, home keeping queen or a corporate honcho, enemies and rivalries/competent in any field comes as an addition to your career. When you feel that these enemies are tossing your life and making you deprived of your benefits, conduct the Sri Shatru Samhara Thrisathi Homa. Your enemies will surrender to you and keep away from creating trouble to you. Shatru Samhara Homam protects us from our enemies and gives us strength to face them. People who are into politics, military, business world should perform this homam to avoid the known and unknown foes. 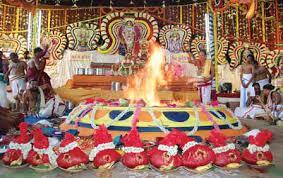 This homam is also performed to remove the Mangal (Mars) doshams. It also bestows a person with good health and enhances family relationships. It helps to retrieve our mental peace and happiness. It solves all the problems like constant loss in business, debts and helps to retain the wealth. 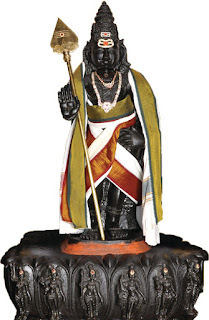 This Homam is done by invoking Lord Murugan to defeat the shatrus (our enemies), our shatrus may be attacking us either directly or indirectly and this homam provides a full protection to the kartha (one who performs the homam) by destroying the enemies (foe) whoever is causing troubles or being an obstacle. 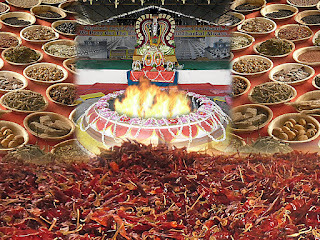 This homam also relieves you from dark and evil spirits and curses and also from dangerous diseases. 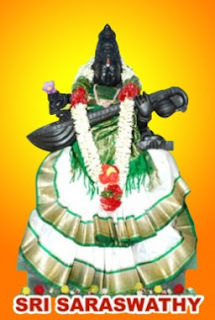 Sri Danvantri Arogya Peedam ,Walajapet - 632513, Vellore District. Vastu Sastra is an ancient architecture science which is mainly used for designing a building in a right direction. It is a suitable one for homes, offices and business firms to gain major benefits. This technique also allows designing and redesigning rooms in the buildings to bring prosperity, wealth and happiness in life. Vastu Shanti Parihara homam is mainly meant for improving the conditions of new buildings by removing negative energies in an effective manner. In fact, it provides methods for overcoming different types of problems to lead a successful life. Vastu defects in a building may cause several disturbances to a person. The Vastu Shanthi Parihara homam is a suitable one for resolving them properly to witness major changes. Vastu Shanthi Parihara homam provides methods for getting remedies from all types of problems by meeting exact requirements. Vastu Shanthi Parihara homam is a suitable one for those who want to avoid potential threats in a building. In addition, this Parihara homam makes feasible ways for overcoming mental disturbances to experience peace of mind. Anyone who wants to get positive energies in a building can choose this Parihara homam for experiencing desired outcomes. Theipirai Ashtami day, is the most auspicious day dedicated to Lord Kala Bhairava. Lord kala Bhairava is a manifestation of Lord Shiva. Kala Bhairava is the God of Time - Kal means 'time' and 'Bhairava' the manifestation of Shiva. Ashtami after Poornima, the eighth day after full moon, is considered the ideal day to propitiate Kala Bhairava. In 2016, Theipirai Bhairava Ashtami is 1st, March.Lord Kala Bhairava is also known as Kshetrapalaka, the guardian of the temple. In honor of this, keys to the temple are ceremonially submitted to Lord Kaala Bhairava at temple closing time and are received from him at opening time. The vahana (vehicle) of Lord Kaala Bhairava is the dog. Feeding and taking care of dogs is another way of showing our devotion to Lord Kaala Bhairava. There are eight types of Bhairavas and they are called ashta Bhairavas. 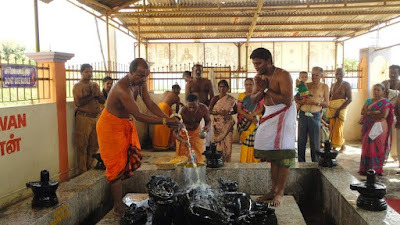 They are Asithanga Bhairavar, Ruru Bhairavar, Chanda Bhairavar, Krodha Bhairavar, Unmatta Bhairavar, Kapala Bhairavar, Bhishana Bhairavar and Samhara Bhairavar. Apart from these eight forms there is yet another form called Swarna akarshana Bahiravar. 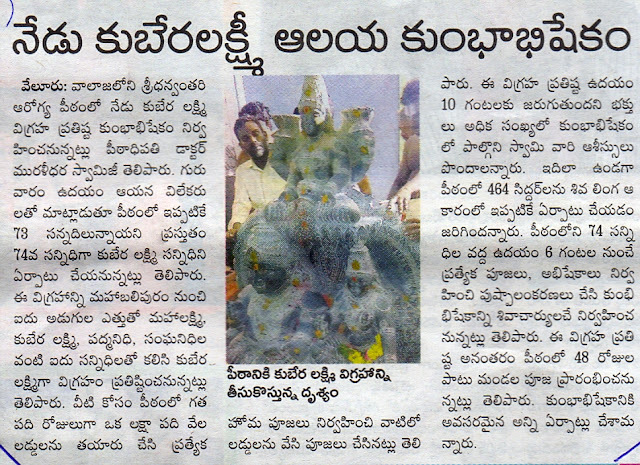 Maha Bhairavar is said to be Shiva himself.The above Bairavars sannathi Installed in danvantripeedam, Walajapet. The Swarna akarshana Bhairavar has red complexion and clothed in golden dress. He has moon in his head. He has four hands. In one of the hands he carries a golden vessel. He gives wealth and prosperity. Time and tide wait for none goes the saying. Controlling time and maintain punctuality is a lacking birth quality for many. Kala Bhairava blesses you with the power of controlling the factor called time and incidents that take place in your life. Kala Bhairava also called the keeper of time is the lord who controls the time and incidents that take place in the human's life. 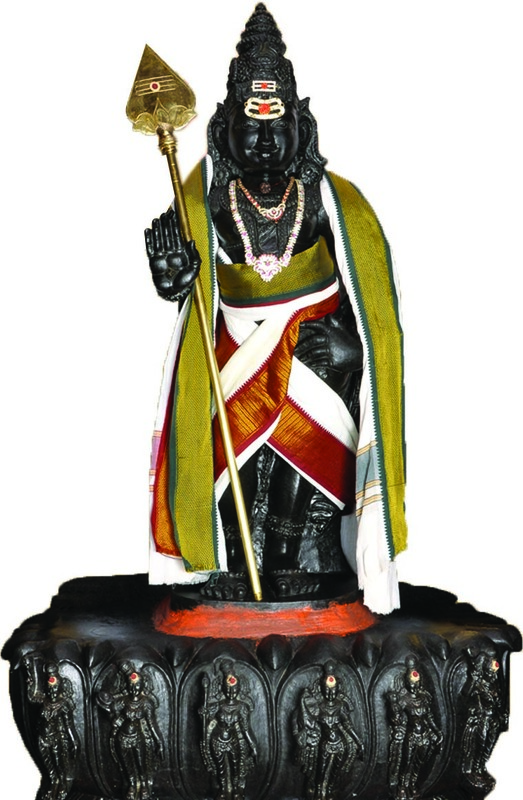 The divine Kala Bhairava stands for Kala-the time period and Bhairava, the keeper of time. You will attain the sheer power to control the time and the incidents that take place in your life with the blessings of Kala Bhairava. He blesses you with the divine power of predicting things that are to happen and to avoid mishaps by controlling time! "Om Kaalakaalaaya vidhmahey Kaalaatheethaaya dheemahi Thanno Kaala Bhairava Prachodhayaath." Purpose Of Homam And Praying This Deity Gives Mutual Understanding And Co-Operation Between Couples, Removes Mental Agony Due To Court Cases Caused By Enemies For Assets. Ashtami Yaga And Special Pooja During Veining Moon Will Give Relief And Solve The Above Problems. Relieves All Diseases That Is Affecting The Human Because Of Constant Hunting For Money Whether One Has Or Not. By Worshipping The Deity, This Will Give Oneness And Mutual Understanding And Co-Operation Between Husband And Wife. 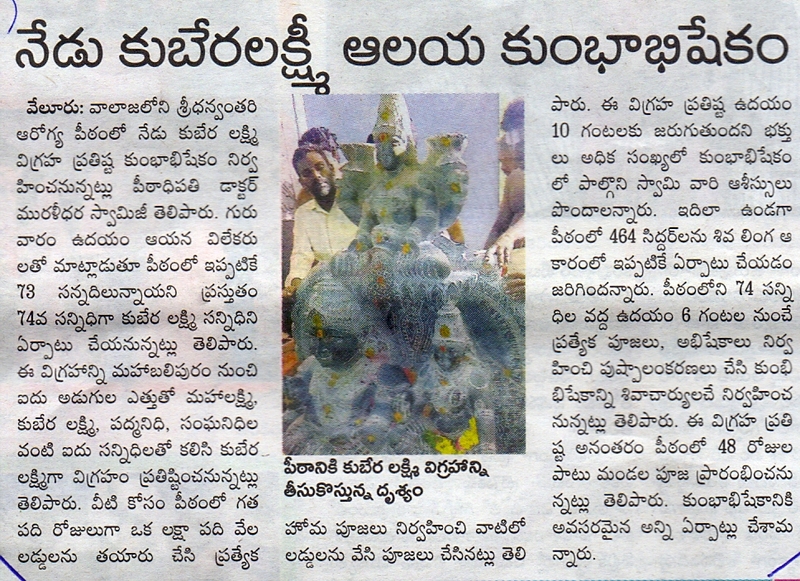 This Deity Also Removes The Mental Agony And Ailment Due To Court Cases Caused By The Enemies For Assets. Ashtami Yagam Is The Special Pooja For The Above Deity During Veining Moon (Theipirai) To Solve The Above Effects. Note: Every Month Theipirai Ashtami Homam to perform Swarna Bhairavar Homam, Morning 10.00 am & Every Month Theipirai Ashtami Homam to Perform Kala Bhairavar AshtaBhairavar Homam, Evening 5.00 pm. 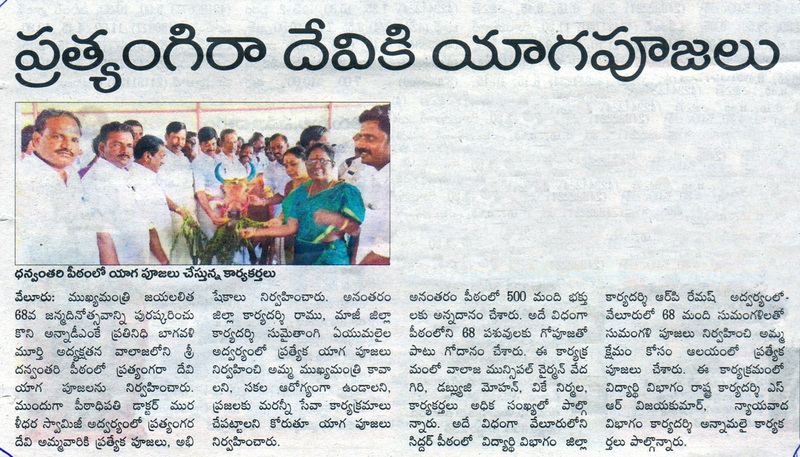 in Peedam Premises. Sri Muralidhara Swamigal conducting Amavasai Yagam on 8th March 2016. Prathyangira Devi, synonymously referred to as Atharva Bathrakali and Singhamukha Kali Devi is a Ugram (Fierce) deity devoted to cleansing all ill wishes, evil eyes, black magic and other such impurities from the path and lives of her devotees. Since she is in a Vega manifestation, this makes personal or home worship of her inappropriate for devotees. Therefore the Maha Peedam gives you the opportunity to partake in this Homam & Pooja Performed monthly on amavasai or new moon day. A homa or fire oblation is made in worship of Pratyangira Devi, the universal absorber of negativity and evil face of the divine mother. 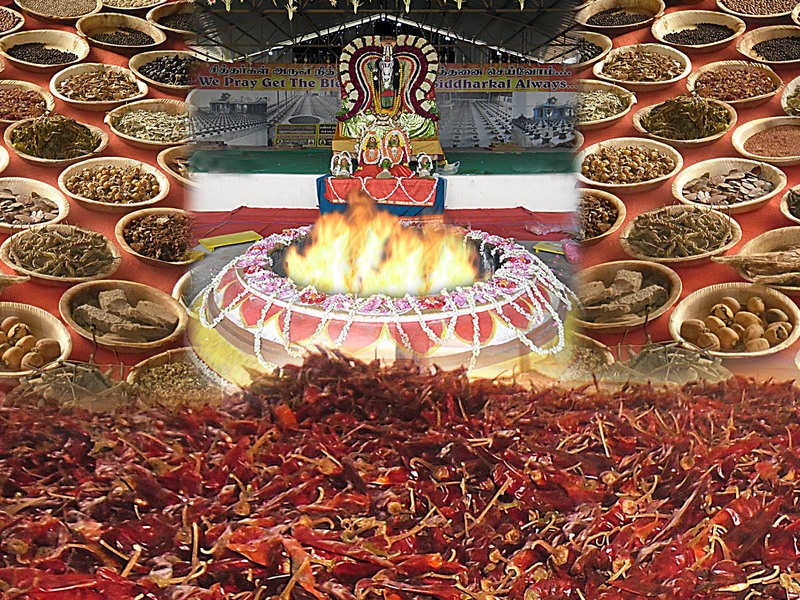 In general, the offering of red chili in any homa is aimed to remove evil eyes (which lurch unto 1 when glanced upon by the envious and ill-wishers). Many people think this is the ONLY or the main offering for pratyangira devi. Pumbkins (Poosanikai): Remove Thristy Dosha. Special Annadhanam follows after the Homam. 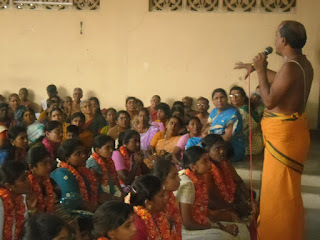 SRI DANVANTRI AROGYA PEEDAM, ANANTHALAI MATHURA, KEELPUDUPET, WALAJAPET, VELLORE DIST. Swayamvara Kala Parvathi homam is being conducted by Sri Danvantri Arogya Peedam, Walajapet, on February 28th 2016, Peedam founder Kayilai Gnanaguru Dr Sri Muralidhara Swamigal has announced. This comes as good news for people seeking a suitable groom, people yearning for happy moments in their marital lives, and women in search of marital happiness. “Om Hreem Yoginim Yogini Yogeswari Yoga Bhayankari SakalaSthavara Jangamasya Mukha Hridayam Mama Vasamakarsha Akarshaya Swaha” . Swayamvara Kala Parvathy Homam is being performed at Danvantri Arogya Peedam, Walajapet, on the last Sunday of every month and this month it will be on February 28th 2016 from 10.00 a.m. to 1.00 p.m. The note from the peedam urges unmarried devotees to participate in the homam and get the blessings of Goddess Parvathy for early marriage. Goddess Parvathi represents virtue, fertility, and marital felicity, self-denial and power. Parvati is worshipped by women of all ages and is considered as an auspicious Goddess! Goddess Parvathi; a representation of Shakti, and the Mother Goddess is the divine consort of Lord Shiva and the main deity of this beneficial Homa. Swayamvara Parvati Homa is performed to appease Goddess Parvati - the Mother Goddess, for removing various obstacles that delay any marriage. The worship of a chosen deity is indispensable for any person in attaining ones desires. Even though God is one, ancient seers have given us various forms of worship for the upliftment of ordinary mortals. Among these various forms of worships, most prominent is that of Shakti or the Divine Mother. The divine mother took the incarnation of Goddess Parvati Devi in ​​order to get married to Lord Shiva. None other than Lord Shiva himself gave the Swayamvara Parvati Mantra to Goddess Parvati Devi. This enabled her to reunite with her divine consort. By performing the Swayamvara Parvati Homa, various obstacles that delay marriage are removed. The eligible groom is blessed with suitable spouse. Panchami Tithis that fall on Fridays are considered auspicious to perform Swayamvara Parvathi Homa. You can also choose your Birth Star days to perform this holy Homa. • Removes obstacles for people seeking for the suitable groom. • Bestows with a happy married life. • Gifts married women with a bountiful and meaningful life. Kilpudupet, Walajapet 632513, Vellore District. On Maha Shivaratri day Shiva Panchakshari Yagam, Annadanam At Danvantri Peedam 07.03.2016, Monday 2016 BY 10AM. Shiva means auspicious. Lord Shiva stands for auspiciousness. He is easy to satisfy and grants material benefits easily, if one surrenders to him fully. Moreover, he is a perfect yogi. He dissolves the delusion in the mind, increases detachment and grants liberation. His worship in fire is very auspicious and accelerates detachment and spiritual progress. Hitch free life, Relief from unwanted problems, Relief from relationship issues, Unity and cordial atmosphere at your work place and home, as well, Clarity in thoughts and deeds, Protects you against all dangers and evil spirits, Blesses you with long life and robust health, Helps to overcome the ill effects of your enemies..
தன்வந்திரி பீடத்தில் லட்சுமி ஹயக்ரீவர், ஸ்ரீசரஸ்வதி ஹோமம் வருகிற 27.02.2016 & 28.02.2016 நடைபெறுகிறது. 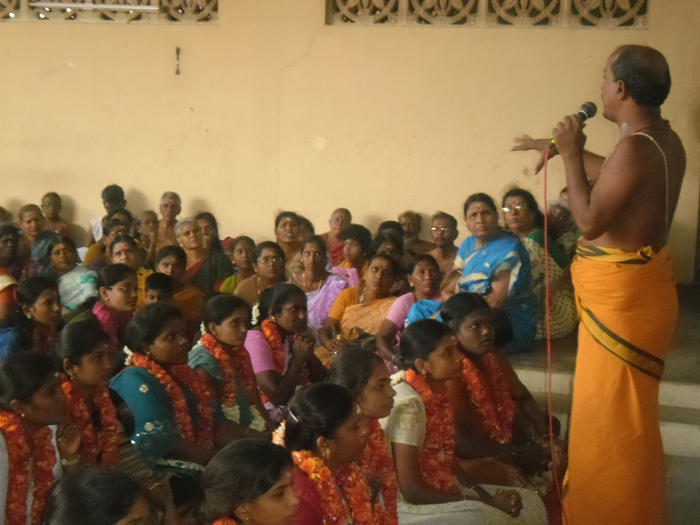 கலைமகளாம் ஸ்ரீசரஸ்வதிதேவியின் குரு, வேதம் மீட்டுத் தந்த பகவான் என்றெல்லாம் போற்றப்படுபவர் ஸ்ரீஹயக்ரீவர். தமிழகத்தில், வேலூர் மாவட்டம், வாலாஜாபேட்டை, கீழ்புதுப்பேட்டையில் ஸ்ரீ தன்வந்திரி ஆரோக்ய பீடம் அமைத்து அங்கு வெளிர் நிற பச்சைக் கல்லால் ஆன லட்சுமி ஹயக்ரீவருடன் வேதாந்த தேசிகருக்கும் சேர்த்து சந்நிதி அமைத்திருக்கிறார் கயிலை ஞானகுரு டாக்டர் ஸ்ரீ முரளிதர ஸ்வாமிகள். என்பதால், இந்தியாவின் பல மாநிலங்களில் இருந்தும் பள்ளி மற்றும் கல்லூரி மாணவ, மாணவியர்கள் பீடத்திற்கு வருகை தந்து ஹயக்ரீவரை வழிபட்டு செல்கின்றனர். பள்ளி மற்றும் அனைத்து கல்லூரிகள் துவங்கும் காலங்களிலும், தேர்வுகள் சமயங்களிலும் விசேஷ ஹயக்ரீவர் ஹோமங்களும், ப்ரார்த்தனைகளும் ஸ்வாமிகளால் நடத்தப்பட்டு வருகிறது. மாணவ, மாணவியர்கள் அனைவருக்கும் நல்ல நினைவாற்றல் ஏற்பட்டு சிறப்பாக தேர்வு எழுதி வெற்றி பெற வேண்டும் என்ற உயரிய நோக்கத்தில் 27.02.2016ரூ 28.02.2016 சனி கிழமை மற்றும் ஞாயிறு காலை 10.00 மணியளவில் ஹயக்ரீவர் சரஸ்வதி ஹோமம் நடைபெற உள்ளது. எடுக்கலாம். மாணவர்கள் ஆகவே பக்தர்கள் அனைவரும் இந்த ஹோமத்தில் கலந்து கொண்டு பயன்பெற வேணுமாய் ப்ரார்த்திக்கின்றோம். Walajapet – 632513, Vellore District. Sri Lakshmi Hayagriva homam at Peedam on February 27th & 28th 2016.. In Hinduism, Hayagriva is also considered an Avatar of Vishnu. He is worshipped as the God of knowledge and wisdom, with a human body and a horse’s head, brilliant white in color, with white garments and seated on a white lotus. Symbolically, the story represents the triumph of pure knowledge, guided by the hand of God, over the demonic forces of passion and darkness. Hayagriva is a very important deity in the Vaishnava tradition. His blessings are sought when beginning study of both sacred and secular subjects. Special worship is conducted on the day of the full moon in August (Sravana-Paurnami) (his avatara-dina) and on Mahanavami, the ninth day of the Navaratri festival. The Hayagreeva Homam is performed by the chanting of the mantras contained in the Hayagreeva Suktam and with the repitition of the moola mantra of Lord Hayagreeva. The benefits of performing this homam are - improvement in memory, concentration, success in knowledge ventures, studies, education and careers related to education, removal of ignorance, tamas, laziness, inertia. This homam is particularly recommended for students, teachers, researchers and spiritual seekers who wish to gain the grace of Lord Hayagreeva. 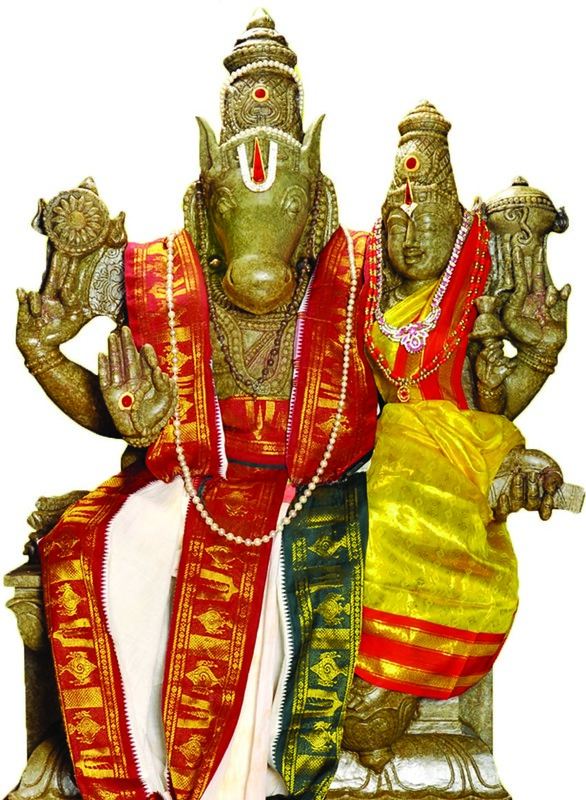 A special Lakshmi Hayagriva homam would be performed at Sri Danvantri Arogya Peedam, Walajapet, on February 27th & 28th , 2016, Peedam founder Kayilai Gnanaguru Dr Sri Muralidhara Swamigal has announced. The homam would be performed on Saturday, 27th & Sunday 28th of February 2016 at 10.00 a.m. to 01.00 p.m.
Hayagriva is worshipped as the God of Knowledge and Wisdom. Children partticularly benefit through worship of Hayagrivar for success in their exams, empowering them through Vedic prayers. His blessings are sought when beginning study of both sacred and secular subjects. The benefits of performing this homam are - improvement in memory and concentration, success in knowledge ventures, studies, education and careers related to education, removal of ignorance, laziness and inertia. This homam is particularly recommended for students, teachers, researchers and spiritual seekers who wish to gain the grace of Lord Hayagreeva. The prasadam sent to you homa bashpam (raksha), kumkumam, sacred thread (raksha), photo of the deity.